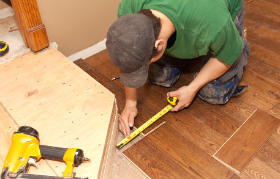 Our floor repair services will prepare your floor boards for sanding and sealing. The cracks and dents will be mended, where possible and if there is some larger damage, some of the timbers on your floor will be removed and replaced with similar ones of the same quality and age. Floor repair is a work better done by professionals. Leave it to our technicians, having a lot of experience, expertise and skills. If your floors have a lot of scratches and marks from pet animals, cracks and damage on the boards, you need professional floor repair. The services, which our company provides in London, will do the necessary restoration work on your hardwood, softwood, laminate or other kind of floor. Before renovation, most floors need to be checked and repaired, where necessary. My new floor looks amazing! Thank you a lot. The parquet in the bedroom had some cracks, now it is perfect again! Great dust-free floor repair service! You guys are the best! 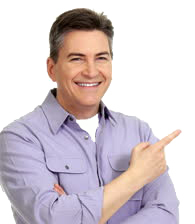 Book a Floor Repair Service Now! If you take advantage of the reliable floor repairs, which our company offers, your floor will be refurbished and rid of all old, broken and loose boards, which are left on it. 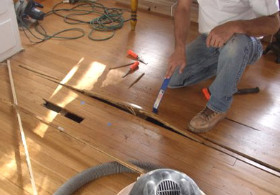 Our technicians will inspect carefully every timber on your floor, test it and choose the best method to repair it. Boards, which are too damaged and can’t be repaired, will be replaced with similar in quality and age, if possible. Our technicians will remove the broken boards carefully and insert the new ones in the proper places. They will also remove all nails, which are out of place, left on the floor. Our professional assessment of the condition of your floor will save you a lot of dangerous situations and future restoration of your floor. Every timber will be checked and tested for stability and steadiness. The loose ones will be fitted and nailed on the necessary places. The boards which are too damaged will be replaced with the best substitute for each one. Use our reliable floor repair services, provided every day during the week in London. They will ensure you well fitted, stable and secured floors, which you will be able to use for a long time.